Kevin Roberts, the Chairman of Saatchi and Saatchi, unexpectedly unleased an avalanche with his comments on gender equality in the ad industry. It cost him his job. Now, the news is filled with industry figures and advocates offering their comments on how to get and keep women in the agency world. I came across this “list of helpful tips” on hiring women from 1943. Let’s see what we can make of them today. Quick caveat – I’m the first to admit these thoughts need to apply to all staff, in all their variations, but I’m aiming them at women because that’s the door Kevin Robert’s opened. 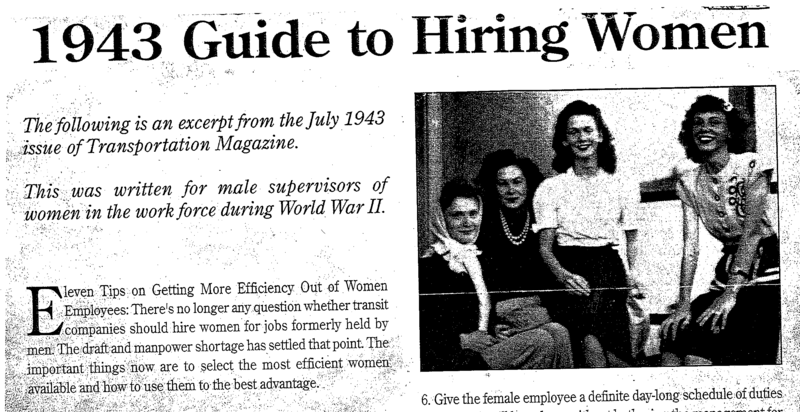 July 1943 issue of Transportation Magazine on how to hire women during WWII. 2016- If you pick young married women, then hang on to them as they have a family. Don’t let great talent slip away because they’d like a little more support and flexibility when they have kids. This is the connected age, find ways to make working flexible. Companies can accommodate the occasional sick child or school play. We don’t need conventional hours and daily face time in the office as a measuring stick for good work and commitment. 2. When you have to use older women, try to get ones who have worked outside the home at some time in their lives. Older women who have never contacted the public have a hard time adapting themselves and are inclined to be cantankerous and fussy. It’s always well to impress upon older women the importance of friendliness and courtesy. 2016 – When you have older women, value their experience and recognise their ambition. Give them a career path that leads to more responsibility and authority. Ask them to help actively recruit the next diverse generation of talent and to support that new group so they have role models. 3. General experience indicates that “husky” girls – those who are just a little on the heavy side – are more even tempered and efficient than their underweight sisters. 2016 – Weighty issues aren’t about body type. Let’s make them about weighing in where it will make a difference, adding value, offering perspective, having a voice in the big decisions the company has to make. 2016 – Give all staff support so they feel part of your organisation. They may not see “people like me” above them or on the board. Give them a mentor so they feel connected, have someone who cares about their career and will help them develop into the next generation of leaders. 5. Stress at the outset the importance of time the fact that a minute or two lost here and there makes serious inroads on schedules. Until this point is gotten across, service is likely to be slowed up. 2016 – Stress from the outset that going home on time is acceptable and something to strive for. Everyone needs an after work. Encourage women to be selective on where they invest their time if they need to get to the school gate. 2016 – Give the female employee challenges, autonomy and a purpose in their role. These are the things everyone finds motivating and you’ll be more likely to keep them. 2016 – Whenever possible, let employees experience what needs to be done in the next job up or in the next department. Shadowing, secondments and moving jobs internally benefit the whole company. Learning is intrinsically motiving and interesting ideas come from spontaneous collaboration. 2016 – Give everyone adequate time to think. For women who have agreed a 4 day week, make sure you keep your side of the corporate agreement. You are paying 80% of the salary – it’s unfair to ask women to change their day off for a meeting or do phone conferences and emails from home. Help figure out how to honour the company’s part in a 4 day schedule. 9. Be tactful when issuing instructions or in making criticisms. Women are often sensitive; they can’t shrug off harsh words the way men do. Never ridicule a woman – it breaks her spirit and cuts off her efficiency. 2016 – Be tactful to everyone, management by fear is not motivating. Ridicule cuts off everyone’s efficiency. 2016 – Every woman feels differently about sexual jokes and innuendo. The universal truth is that no one wants to be embarrassed or belittled. A fantastic read, thanks Kathy. A bit of a giggle that this was actually published (and ok!) in an industry magazine. I had never before seen the words ‘cantankerous’ and ‘husky’ outside of fiction writing. Thoroughly enjoyed your updated versions. Thanks Claire, some things are stranger than fiction. Thanks for jumping in and making it a conversation.